A full list of our Discovery Boxes and an explanation of Heuristic Play can be found under the labelled tab at the top of the page or click here. 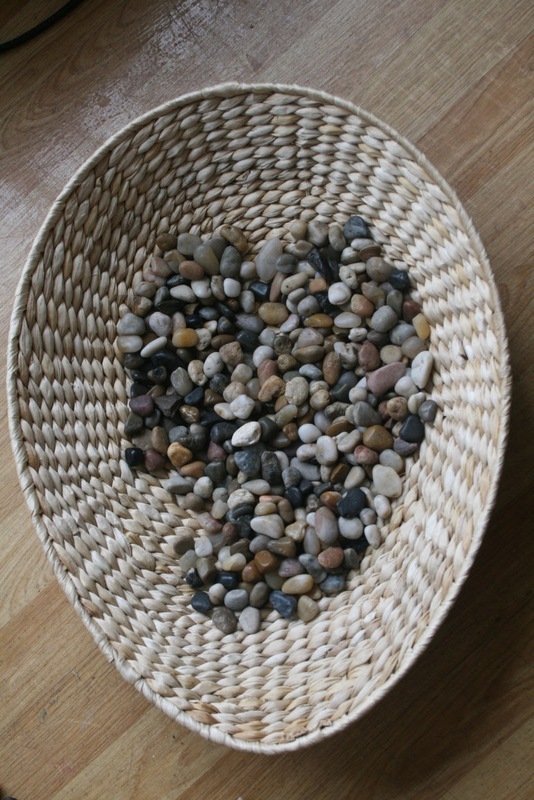 I found a lovely egg shaped basket and natural pebbles on sale in Ikea this week and just knew they would be lovely for a Heuristic play session due to the lovely contrasts between the two natural materials, as well as the opportunities for scooping, pouring, sorting and arranging. As usual with these Discovery Boxes (or baskets! ), I didn’t intervene or suggest any particular way for C to play with the materials. I sat with her and talked to her as she busied herself and helped her to get things that she wanted to add and later I opened up new ideas for things to do with them as the play developed. She enjoyed feeling the stones and picking them up and dropping them back into the basket. She asked for somewhere to put them so I got her a serving dish that had two sides, which gave an opportunity for sorting into two categories. First of all she just scooped the pebbles in, then tipped the rest and played with them by transferring between the different containers and spaces. Then I started to pick some out and talked about the shapes, textures and shades I could see, keeping some of the dark ones on my side of the dish and leaving the lighter ones on hers. She started to describe them too and picked out some dark ones to give to me for my little collection, which was now taking over one whole side of the dish. 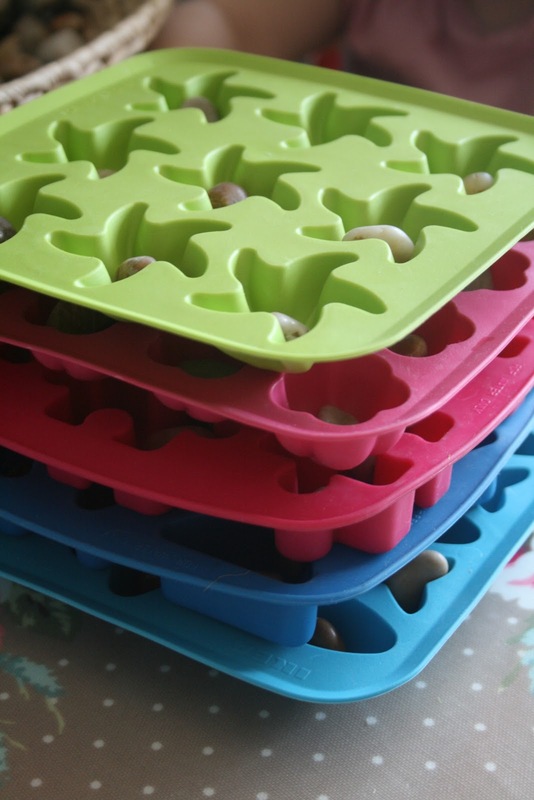 Then she went and helped herself to a whole pile of shaped ice-cube trays (also from Ikea- love them!) and lay them out so that she could drop a pebble or two in each hole. This automatically led onto counting and she used 1:1 correspondence for some of the time, by pointing at each hole. Then she stacked them up and told me that they were “all done” and went off to play somewhere else. « We’re Going On A Colour Hunt! Oooh, those pebbles are so beautiful. We live down the road from Ikea, and I’ll probably have to pick some of these up on my next trip there! I love the choo-choo track. Looks like a lot of fun! My daughter has a great love for rocks and pebbles! She collects them and brings them inside! Recently she brought a huge rock in and I have no idea where it came from! Your last picture of the choo choo track reminds me of the artist Andrew Goldsworthy! He uses nature (rocks,leaves) to create amazing art turned to photographs! Google/Image his name! Thanks for stopping at my blog and leaving such wonderful feedback—it made my day! We had a lot of fun! 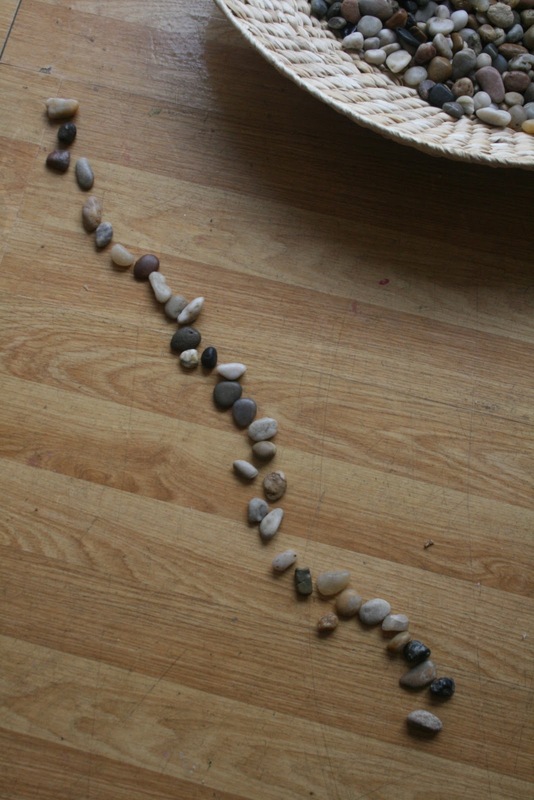 Your daughter is creating art in that last picture in the eyes of Andy Goldsworthy! I had thought they would use them as props for their cooking play, but it was pure sensory fun and exploration. Lovely. Oh! Playing with pebbles is so lovely! They really are wonderfully tactile and you can do some different things! Love it! I have noticed the children become so serene and focused when playing with pebbles! I love the simplicity! This is gorgeous! Love how little ones can take something so simple and turn it into something amazing! I also want to take this opportunity to thank you for this blog – i cannot stop coming on here! It is fabulous! I am also an early years trained primary teacher but have been at home with my litle ones for 4 years (my eldest is nearly 4) and i have not found anything so inspiring and motivating on the net that comes close to your blog! I feel like im back in the ‘F. S. game’ and i am so excited! Thank you! I totally love your blog. Im new to homeschooling and trying to do activities with my 3.5 year old daughter and an almost 2 year old boy. But I have a question. don’t these things the pebbles, the straws, the buttons etc that you give your children to play with, don’t they end up scattered ALL OVER THE HOUSE? Mine do and its one heck of a job clean up which leaves me stressed out soo much that i vow never to give my children anything ! Help!